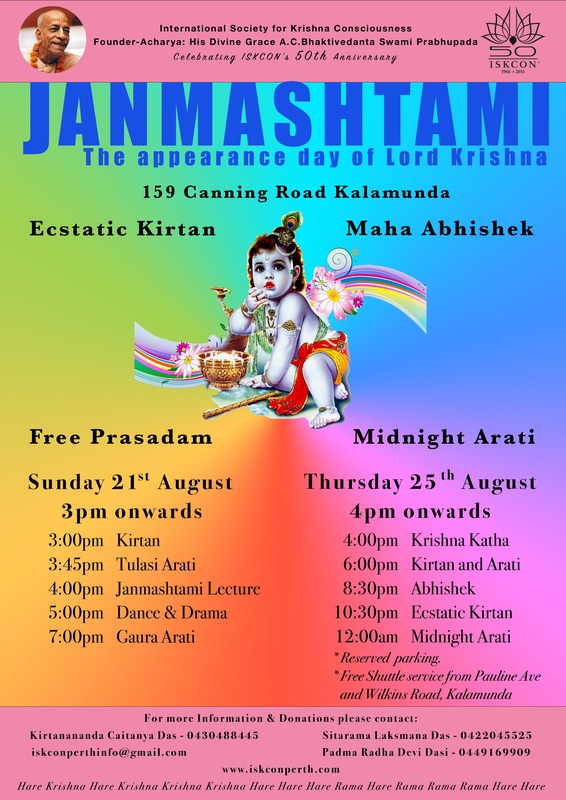 Please Join us on Sunday and Monday for a wonderful 2-day Janmastami festival celebration! Don’t miss out any of these fantastic events! ‘The Witness’ by Krishna’s Puppets. 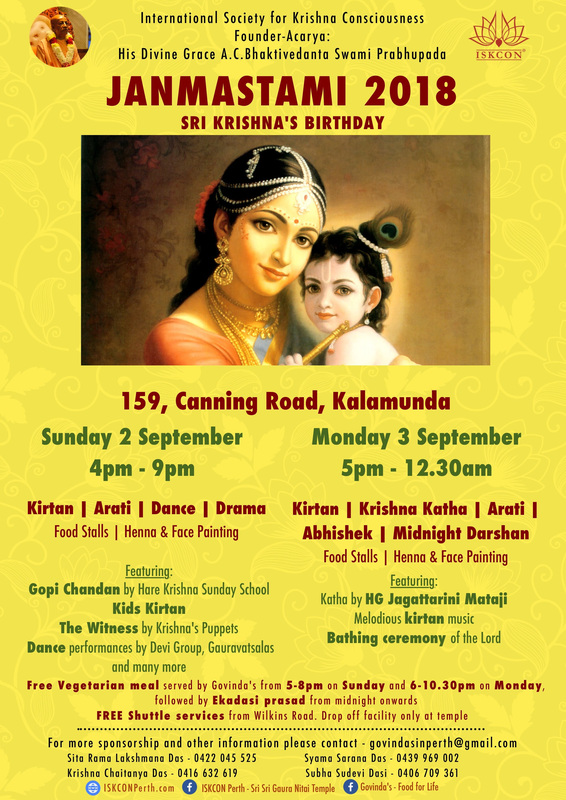 Prasadam Served from 5 pm to 8 pm on Sunday 2 September. 12:00am Midnight Arati – Amazing Darshan- Not to be Missed! 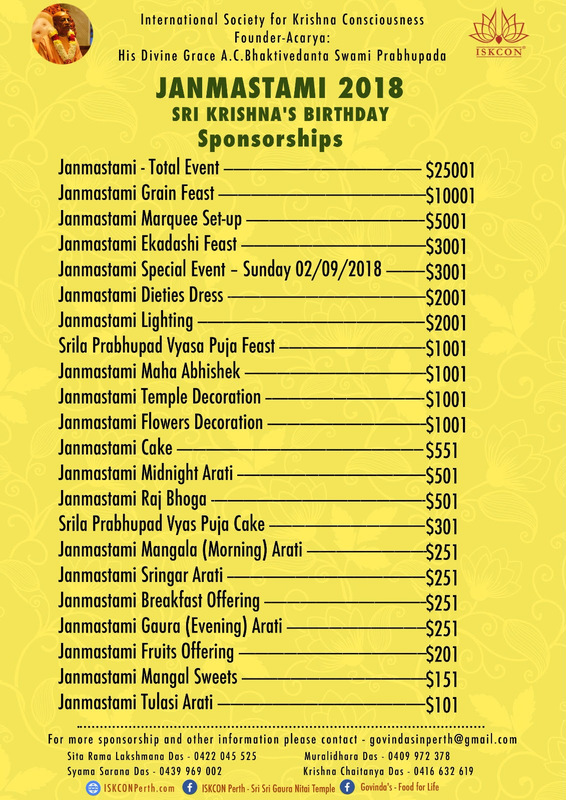 Prasadam served from 6pm to 1030pm on Monday 3 September and midnight to 0130AM on Tuesday 4 September. You can also visit one of our many stalls during the festival. From Henna art to face paint, kids games to sweets shop, information desk and various food stalls, there is plenty for you to do at the festival. Looking forward to seeing you and the family for the big event! NO RIGHT TURN is permitted into and out of temple premises. Only LEFT Turn is permitted. Coming from Welshpool Road Continue straight from Lesmurdie Road roundabout on to Lesmurdie Road East. Coming from Kalamunda Road Turn LEFT in to Hare Krishna Temple When exiting, turn LEFT on Canning Road (Do NOT turn right on to Canning Road) At the next roundabout, make a U-turn to head towards Kalamunda Road. We encourage you all to car-pool where possible. Please cooperate with all our volunteers and follow their directions. As we get thousands of people visiting us on the day and the parking space is limited, not everyone is able to park inside the premises. On premises car parking is now full. So if you have not received your permit, you will be unable to park your vehicle in the temple premises. FREE shuttle services will be provided for all our visitors to use on both – Sunday and Monday. 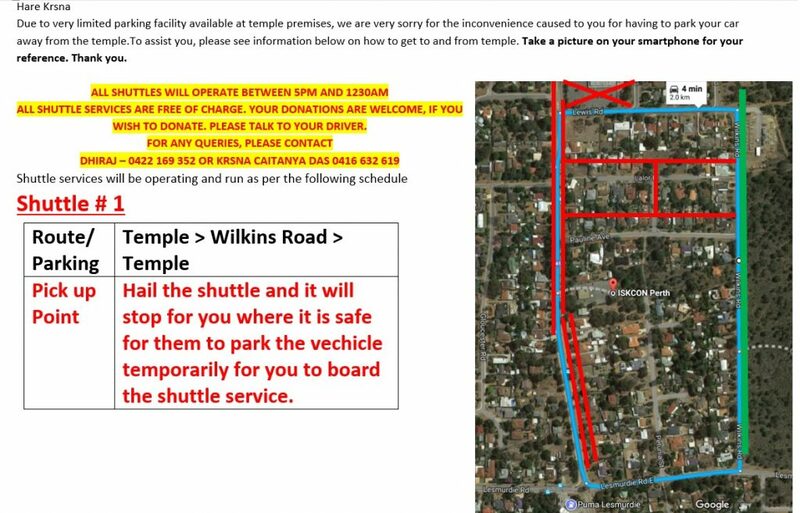 On Sunday only Shuttle 1 will operate between Wilkins Road and Temple, and Shuttle 2 will operate between Kalamunda Water Park/ Council office and Temple. 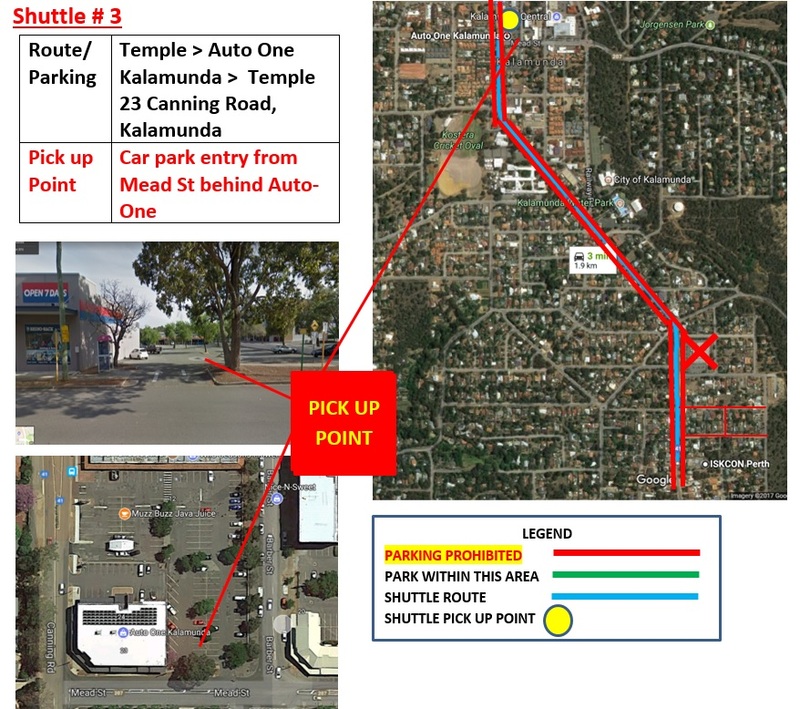 On Monday Shuttle 1 and 2 will be as per above and Shuttle 2 will also extend to Kalamunda Market (behind AutoOne). Maps for shuttle services are as below. Turn LEFT only from Canning Road into the Temple. For permit holders, have your permit displayed in your front windscreen clearly. After dropping off your passengers, park only in authorised locations as nominated by the parking volunteers. Follow directions given by parking volunteers when you arrive to drop off your passengers. Do not park anywhere where parking is not permitted. Do NOT Turn RIGHT when exiting the Temple. You can catch following services to and from the festival using public transport. 3:00PM – Catch Bus # 299 from Elizabeth Quay bus stand D6. 3:55PM – Arrive at ‘Canning Road after Pauline Avenue’. 3:57PM – Walk 2 min and arrive at 159 Canning Road, Kalamunda. 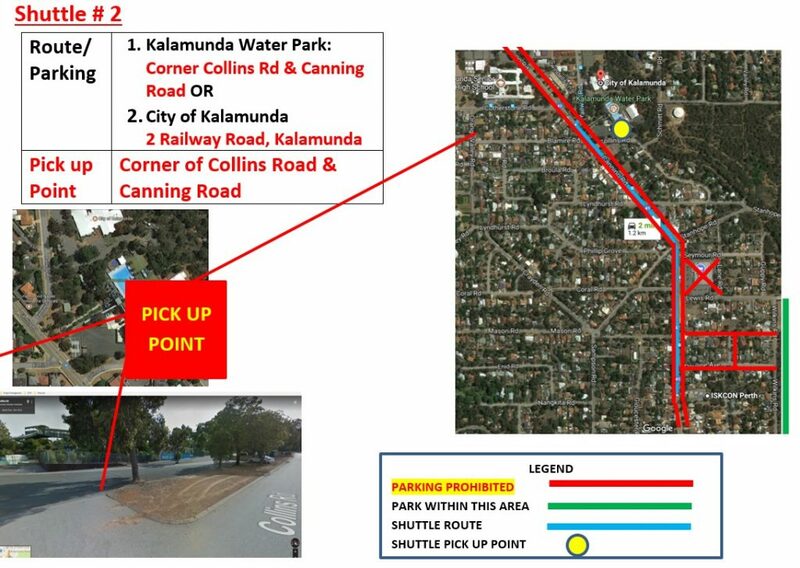 0540PM – Catch one of our shuttle services to go to Kalamunda bus stand. There are no public transport services after this service on Sunday. 10:25PM – Catch one of our shuttle services to go to Kalamunda bus stand. There are no public transport services after this service on Monday. Donation Credit Card Donation – Click here to make credit card donation Bank Transfer – Here are the details to make bank transfer. Legal name: ISKCON Perth BSB: 036-041 Account number: 120564. Please do not forget to send email to govindasinperth @ gmail.com with your details and transferred amount. We need lots of volunteers! (Serving Prasadam, kitchen duties Cleaning). Please come forward and help us. Please contact any of the following devotees regarding sponsorship or if wanting to offer some help.